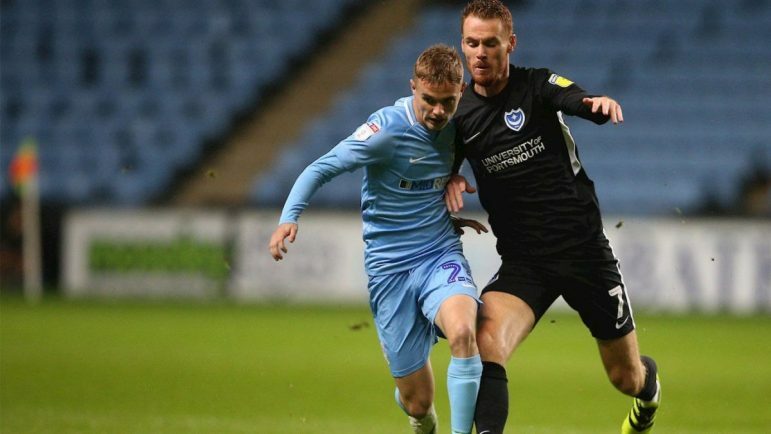 Coventry's Luke Thomas again showed his electric pace against Portsmouth. Picture by PA.
COVENTRY City go into Saturday’s fixture at play-off contenders Charlton Athletic knowing they are not far away from the top sides after closely fought back-to-back home games against Sunderland and table-toppers Portsmouth. But the dearth of goals which has hampered their Division One push since promotion last season descended into a scarcity of chances against Pompey last night, after Saturday’s extremely encouraging second half produced a pulsating 1-1 draw against the Black Cats. The Sky Blues were again intricate in possession, but lacked cutting edge in the final third as they went down 1-0 to Kenny Jacket’s side from the south coast. His club’s decision to ban their loanee to Coventry, Conor Chaplin, from playing last night could have been pivotal, as the Sky Blues lacked their creativity and movement in and around the box shown since his arrival last month. Too many midfield and forward players again made decent contributions but with a concerning lack of end product, including the pacey wideman and Derby loanee Luke Thomas, and battering ram and Saturday’s scorer Jonson Clarke-Harris. He missed a one-on-one chance against the alert Pompey keeper Craig MacGillivray before a contrasting fine finish just before half time from Ronan Curtis. Coventry built possession well but were ponderous – notably with the returning Tony Andreu at times too methodical in the number 10 position – against a Portsmouth side who looked disciplined and physical but often sloppy. They failed to impress as title contenders, which the well organised Sky Blues must take some credit for. Jodi Jones came on for his second very encouraging substitute appearance since his year-long injury lay-off, and occupied a space between Pompey’s defence and midfield lines, controlling possession. The match also saw more injuries to Coventry’s defence, with Dominic Hyam now likely to join Junior Brown in being out with concussion, to add to injuries to Jack Grimmer and Brandon Mason. But Charlton – now six points above Coventry in seventh place – showed they are fallible, losing 5-3 at Scunthorpe on the night. Coventry City boss Mark Robins said: “I am disappointed because we have had to change the back four around again. Obviously we lost Dominic Hyam and we become really young then. “Having said that, I thought that Jordon [Thompson] did really well up against a good player in [Ronan] Curtis and minimised their threat. “We had a good chance and missed it, and they had a good chance and scored it. That is the difference. “We started to look like we were going to build a head of steam up – we made positive changes, we were moving forward and the crowd started to lift and it just fizzled out which is disappointing. “Overall, not enough was done, not enough chances were created and the chances we did create we did not take and it proved costly. “You can see why they’re at the top of the league – they are very functional and have good quality up top with [Brett] Pitman and their two wide players who we kept fairly quiet tonight.